Samsung went all out on it’s event to announce the Galaxy S4 handset, showing off all its new features in ways that only Samsung could. Meaning it was kind of quirky and weird yet business-like at the same time. Basically, it was your typical press conference in between tap dancers, actors, musicians, and movies. Even if you watched the live stream, some of the information you wanted may have been lost in the performance – unless you process things better when it’s delivered by guys miming backpacking in foreign cities. So here’s all the information you need to know about the Galaxy S4, in layman’s terms. The first thing most people turn to when they’re scoping out a new phone is the spec list. 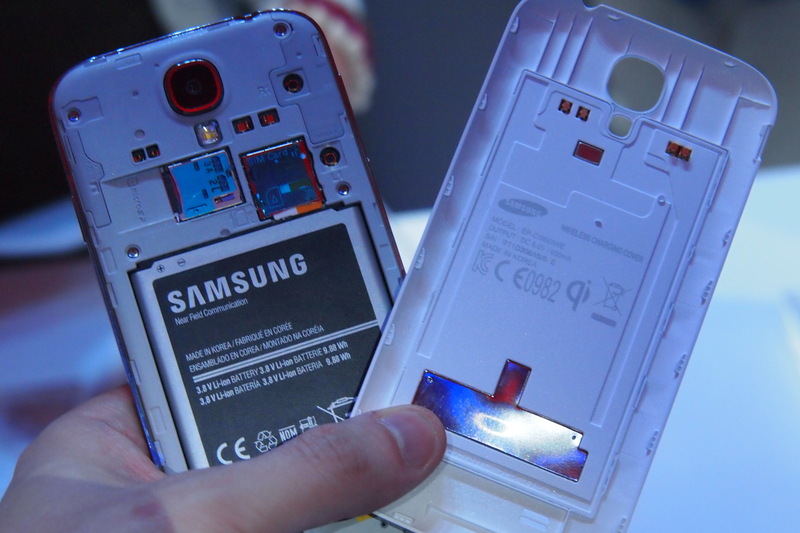 A glance at the details on the Galaxy S 4 are sure to impress. The phone weighs in at 130g, thanks in part to it’s trimming down to just 7.9mm of thickness. It’s surrounded by a polycarbonate case. Despite the slim physique, there’s plenty packed inside the device. A Snapdragon S4 Pro, 1.9GHz processor, the newest offering from Qualcomm, will lend its power to the device. It along with 2GB of RAM will run Android Jelly Bean 4.2.2. Storage will vary between16GB, 32GB or 64GB and can be expanded with the microSD card slot. All of this will be kept alive by a 2600mAh battery. As usual, the display on this Samsung device is, well, on display. It’s an impressive 5-inch full HD Super AMOLED screen, which Samsung claims is the first of its kind. Packed into those 5 inches is a full 441ppi which considerably trumps the iPhone 5 (326 ppi) and the Galaxy S3 (306ppi). It is also protected with Gorilla Glass 3. 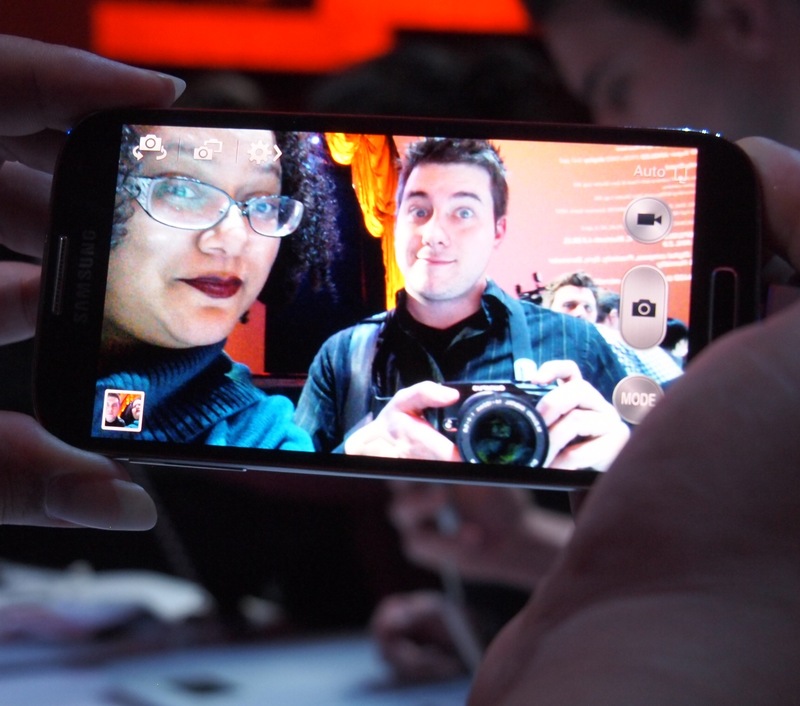 The camera got a huge makeover on the Galaxy S4, and Samsung made sure to show off as much of it as it could. The front-facing camera sits at 2 megapixels, while the rear-facing camera got a boost up to 13 megapixels. That 13MP number still has some allure even though it’s not the first to hit that plateau, but it’s what the camera can do with those megapixels that really matters. The camera will have a plethora of unique capture modes, including a feature that allows users to snap 100 shots in a four second span or capture audio in sync with their image captures. Of course, if there’s anything in your pictures that you don’t like, you can take care of them with the new eraser tool that can take out unwanted parts of images. Despite the eraser tool, there was a big focus on capturing more with the Galaxy S4’s cameras, which is accomplished with the new Duel Camera mode. This allows users to use both cameras on the phone simultaneously. This function plays in when capturing video, now allowing the videographer to be included in the footage, or while on a video call to share what you see. 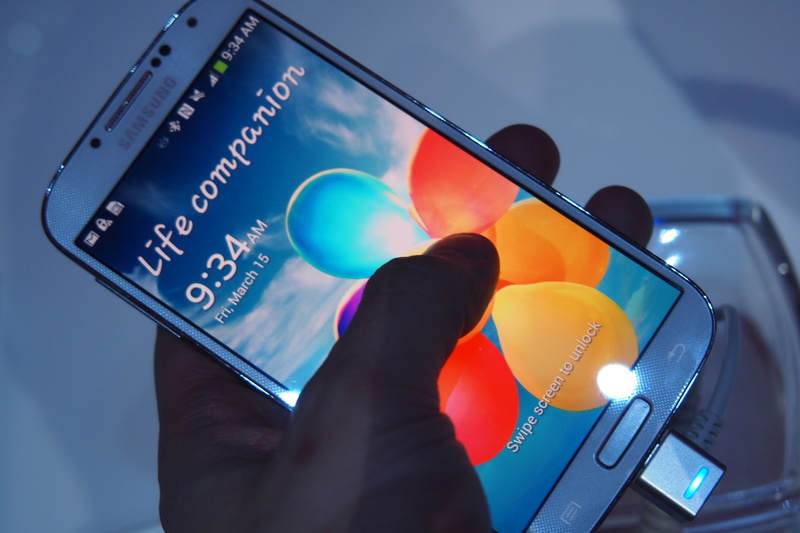 As with its previous devices, Samsung has put a special emphasis on sharing with the Galaxy S4. This time it comes in the form of the Group Play and Share Music, two multimedia-focused options. Group Play allows users to engage with others around them, making it possible to share music, photos, documents and games – no Wi-Fi or cell connection required. In a similar fashion, Share Music lets users have the same song playing on synced phones to create a sort of faux stereo sound. With any phone, communication is key. It’s kind of what the phone is for, after all. 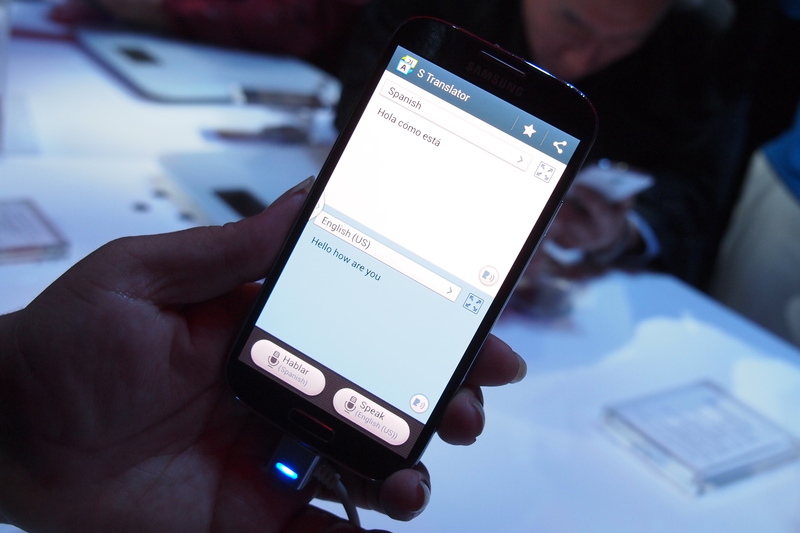 The Galaxy S4 attempts to make communication possible across language barriers. It’s solution to the problem is S Translator. This feature will provide an instant translation via voice or text. It functions in multiple applications including email, text message and ChatON. The idea to bridge the gap between languages is one that should appeal to frequent travelers who find themselves in a foreign land. Adding to the ‘S’ branded services is S Voice Drive. This is a different kind of communication. Instead of talking to friends or new friends who speak a different language, you’ll be talking to your phone with this feature – and your phone will talk back. It’s Samsung’s version of voice command GPS, which you can activate and control while keeping your hands on the wheel. It connects to the Bluetooth in your car and automatically switches on driving mode, which will convert directions to speech to talk you through your trip. 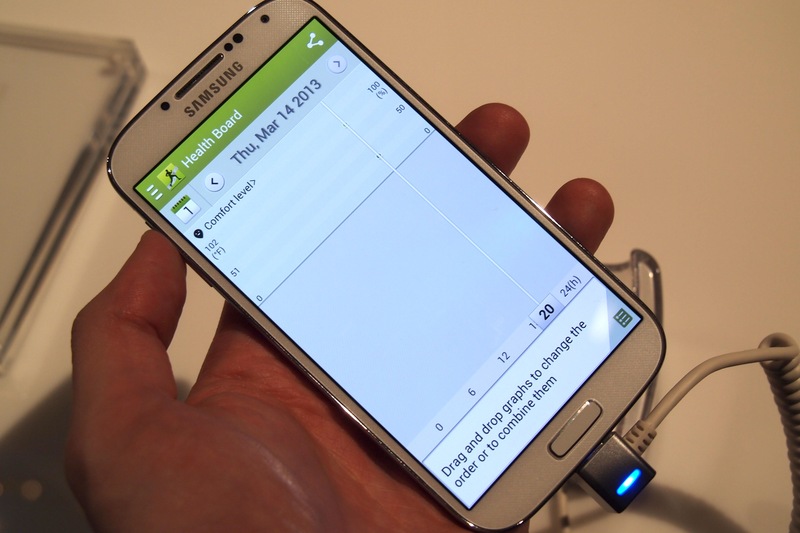 A bit of an unexpected feature, S Health is the Galaxy S4’s built in personal health system. It will function with additional accessories, perhaps an opportunity to cash in on the exercise accessories like Nike+ and the like. The sensors built into the device itself will be able to monitor certain parts of your health and offer feedback in regards to your quality of life. It also has a food diary and sleep monitor, though it might be questionable as to how healthy a lifestyle choice it is to sleep with your phone close enough that it can monitor you. While most smartphones are all about touching, there are a significant amount of hands off features coming with the Galaxy S4. The most talked about of this class are the “Smart” features, the ones that track your eyes to see if you’re looking at the screen. Smart Pause will put a video on pause when you look away to make sure you don’t miss any action on the screen, while Smart Scroll will keep the webpage moving as your eyes reach the top or bottom of the screen. Continuing the theme of hands off is Air View, a borrowed feature from the Galaxy Note line. This allows users to simply hover over things on screen to perform actions. You can browse your pictures by miming a swipe, preview a video by holding your finger over the screen, or accept a call by waving your hand. These aerial gestures make it possible to complete standard tasks without having to physically touch the screen. Phones are so much more than phones now – though we’ve yet to see one that is also a toaster, much to our dismay. 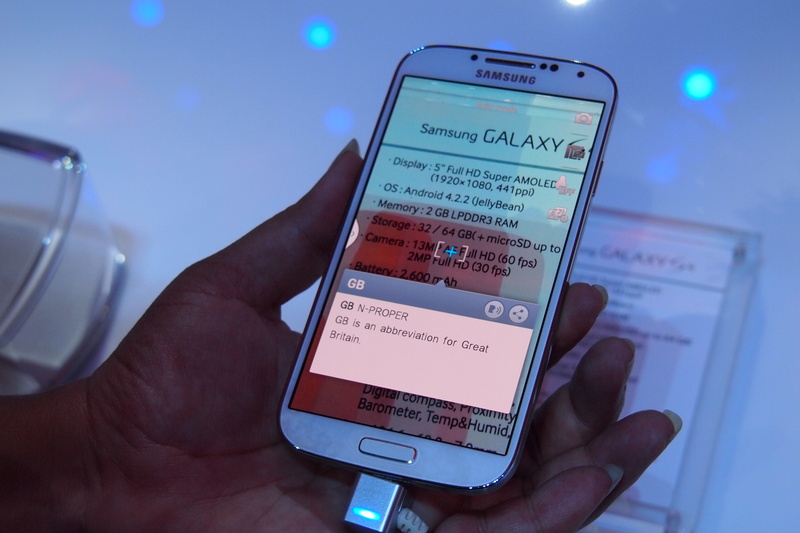 But Samsung has loaded up the Galaxy S4 with some non-typical phone features with an emphasis on media interaction. Taking the QR scanner feature to a new level is the Samsung Optical Reader. This function is capable of recognizing text and QR information and can complete tasks with said information: including translations, placing a call, sending a text, or completing a search. Whatever the scanned information dictates, the phone is capable of doing. If the whole idea of reading turns you off, even if it’s your phone doing it, then maybe you’re more of a TV person. If you find yourself sitting in front of the big screen with your little screen in hand, you may as well make the little one useful. That’s where Samsung WatchON comes in. It uses infrared to turn the phone into a remote control for anything from your TV to your DVD player or even your air conditioner if you really want – though we don’t suggest watching that. Finally, a new adaptive take on media aims to provide a more optimized experience on the phone. Adapt Display is designed to provide a better overall viewing experience and is customized for different applications to make sure they are making full use of the phone’s display. Likewise, Adapt Sound offers a personalized audio experience for each user based on their personal sound preferences. 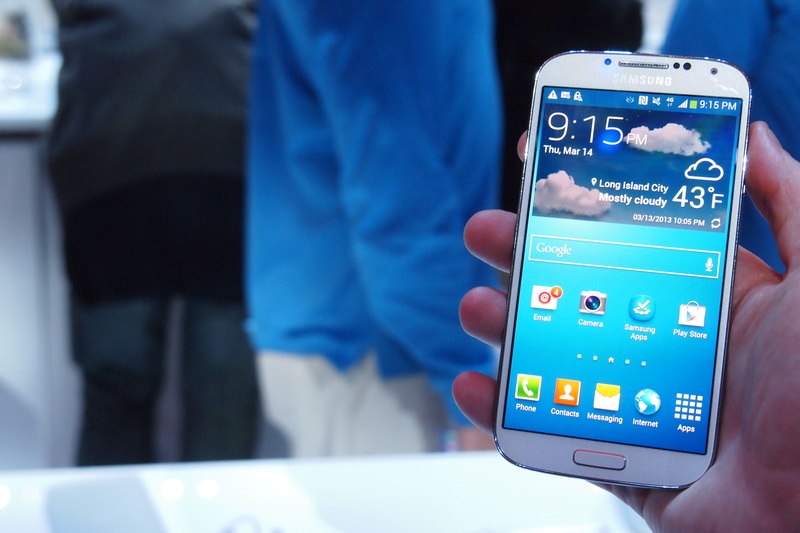 The Samsung Galaxy S4 will be available globally by the end of April, hitting 55 countries and 327 carriers. Included in that list of mobile providers are AT&T, Sprint, T-Mobile, Verizon Wireless, as well as US Cellular and Cricket in the U.S.; Carphone Warehouse, Phones4U, and EE in the U.K.; and Bell, Eastlink, Fido, Koodo, Mobilicity, Rogers, SaskTel, TELUS, Videotron, Virgin Mobile and Wind Mobile in Canada. No price has been announced for the device yet and it is likely to vary based on carrier. We’re guessing it will cost $200 with a two-year contract. Regardless of price, if you’re ready to make the leap based on everything you read above, AT&T has a landing page for the handset and T-Mobile has a pre-order page so you can be the earliest of early adopters.